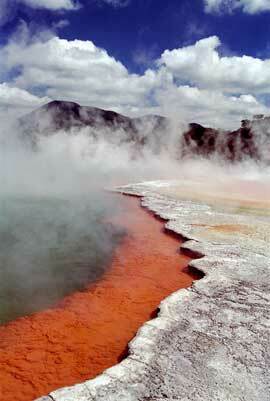 Rotorua is well known for its geothermal activity. 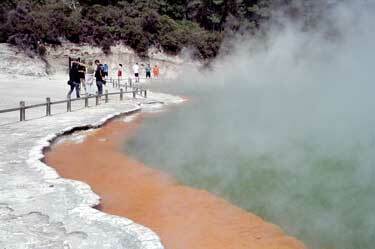 When you're fond of the smell of rotten eggs, Rotorua definitely is the place to be. 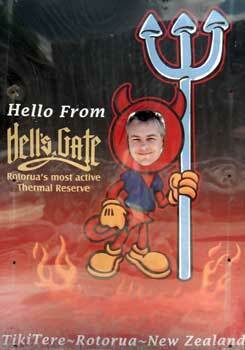 Apart from the smell, geothermal activities are fascinating to see. There are several places where you can have a look. There are a few geysers, but after visiting Iceland a geyser which is pumped into life with soap is not so much fun. 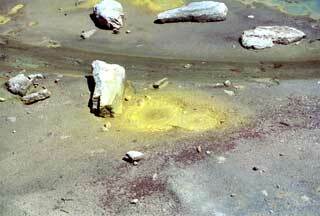 The colours of the geothermic pools are great, though. When looking at the steaming and the foul greeny water you would imagine little can live here. 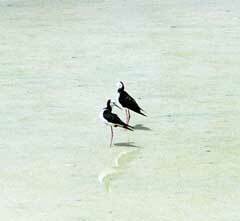 But a couple of birds were standing in the pool, probably trying to catch something to eat. 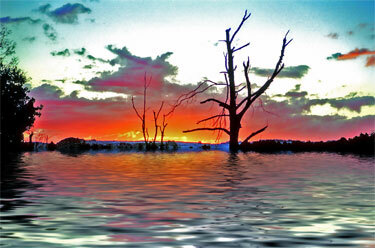 At other places the bush grows to the edge of the water, looking very much alive. 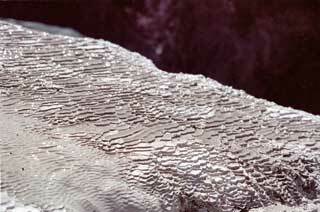 And other birds nest in the wall of one of the craters, nice and warm for the eggs to hatch. It is not so poisonous, after all. 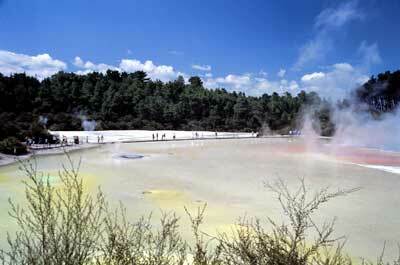 We did found out, however, that the amount of geothermal activity was not directly correlated to the amount of colours you find. 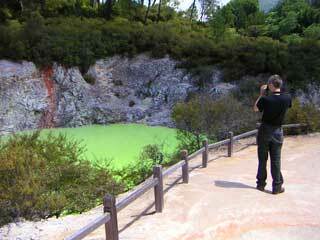 Who especially want to see a lot of colours, should visit the Champagne Pool, with the orange brim on the pictures above. 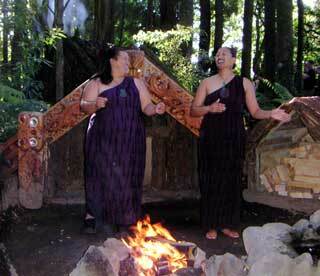 Another thing you should do at Rotorua is a Maori hangi. There are some held at hotels, which doesn't seem that great to us. 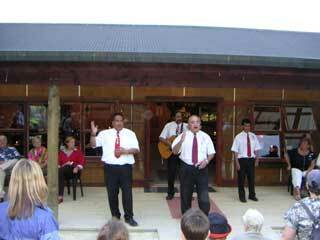 We did one at a real Maori village. 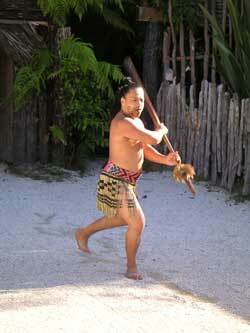 Although it is partly a show for tourists, it does show a bit of the Maori culture. The best view into the Maori mind you get at the end of the evening, when the bus drivers start to sing. In the bus on the way back to Rotorua we all had to sing too, ordered by country. We were prepared, as we read the guidebooks, and sang a children's song. But we never expected to do more singing along the journey throughout New Zealand. In New Zealand we hoped to see a lot of beautiful sunsets. Although we we didn't see as many as we'd liked, we think we had our share. 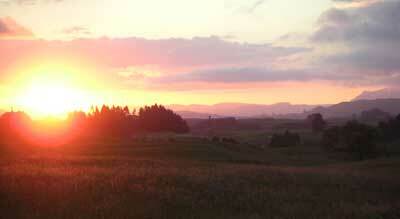 The one on the right is a sunset close to the Maori village. Our bus driver was the only one who stopped and let his passengers out to take pictures. Thanks, Ngata. 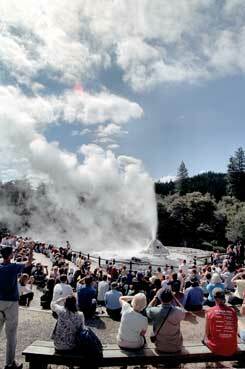 The Aratiatia rapids are turned on a few times a day, just like the Lady Knox geyser. What is it with those Kiwi's? At this point, a power station is built, blocking the original flow through the gorge. 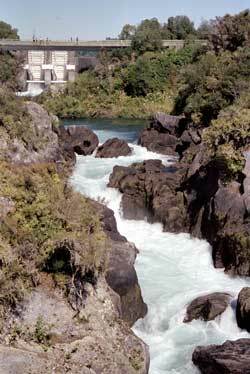 But to satisfy the tourists, a couple of times a day the sluices are opened and the rapids flow as before. 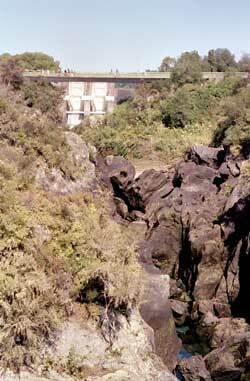 It gives a rare view, to see a dry gorge fill up with a torrent until there is a real rapid.